NY Greek Americans players speak on the 6-5 penalty kick win over their rivals NY Pancyprian Freedoms in the Eastern NY Amateur Cup final and of the club's aim of winning the national double and the CSL. NY Greek Americans’ 6-5 penalty kick win over NY Pancyprian Freedoms in the Eastern NY Amateur Cup final was by no doubt the toughest victory in the club’s quest of winning the national double and the CSL this season. "It is an incredible feeling to have won the game in the fashion that we did," veteran defender Joseph Ruesgen said, “for a long period of time, I am sure not many would have thought we could pull it off. Being that is was against our biggest and oldest rival certainly sweetened the occasion even further. "It certainly was a moment of pure elation and one that was enjoyed thoroughly by everyone associated with the club." NYGA was down by two goals in the second half. Captain Shaun “Fozzy” Foster pulled one goal back for the Greeks, lobbing the ball over the opposing keeper. 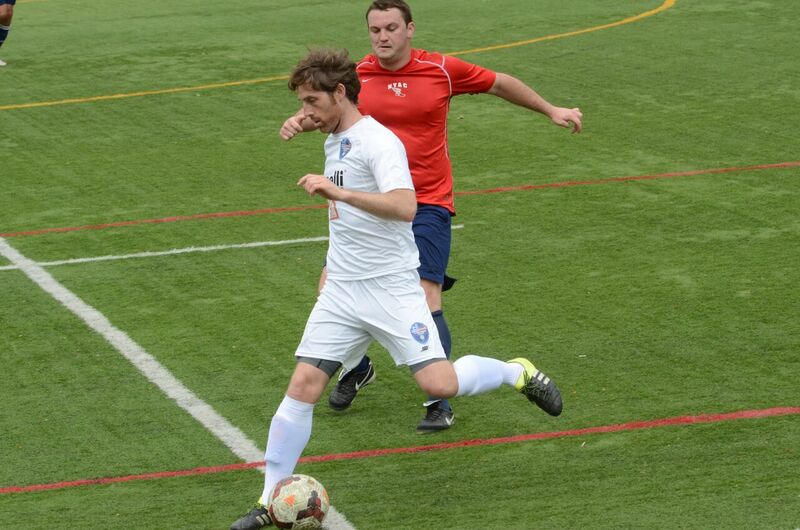 Foster was instrumental in NYGA’s equalizer also. The defensive midfielder hit a right footed shot that hit the crossbar; the rebound fell to Colin Murphy, who volleyed the ball off a NY Pancyprian player and into the net. NY Greeks playmaker Stephen Roche praised Foster for guiding the team to the 2-2 draw before the penalty shootout. The CSL champions were confident going into the shootout. Both teams netted their first five penalties. Pellegrini blocked the Freedoms’ first sudden death spot kick but Tristan couldn’t capitalize on his opponents’ miss to win it for the Greeks as he also failed to convert his PK. Pellegrini blocked NY Pancyprian’s seventh kick. Ruesgen was the next NY Greeks kicker—a left back who captained the team when they won the Amateur Cup in 2014. Ruesgen’s spot kick booked a spot in the regional stages of the Amateur Cup to keep the club’s dream of doing the undoable--winning the national double and the CSL in one season--alive. NY Greeks top scorer Tyler Botte expressed how happy the club members were after the win. “It's so awesome to see the reactions and hear how much it all means to Tony [Bouklis], George [Mellis], Jimmy and the rest of the Greek-American board members that put in so much time and effort on a daily basis because they absolutely deserve it. The forward also admitted how difficult it is to reach their aim of bagging the national double and the CSL title but he's confident. As of now the club clinched the regional stages of the Amateur Cup, will play Lansdowne in the ENY Fricker Cup final and sits in fifth place in the league, one point below the last playoff spot.